"Hereditary" opens in theaters Friday, June 8. Twenty years ago this fall, Toni Collette came to Philadelphia to film a role as the mother character in an unheralded but ambitious thriller/horror film from a young and obscure writer/director. That film was 1999’s “The Sixth Sense,” a massive hit that put M. Night Shyamalan on the map, notched Collette an Oscar nomination, and is recognized almost universally as one of the great Philadelphia movies. Now, Collette has another maternal role, in another very scary film that also boasts influences from outside the horror genre, and also comes from a young, previously unknown filmmaker. 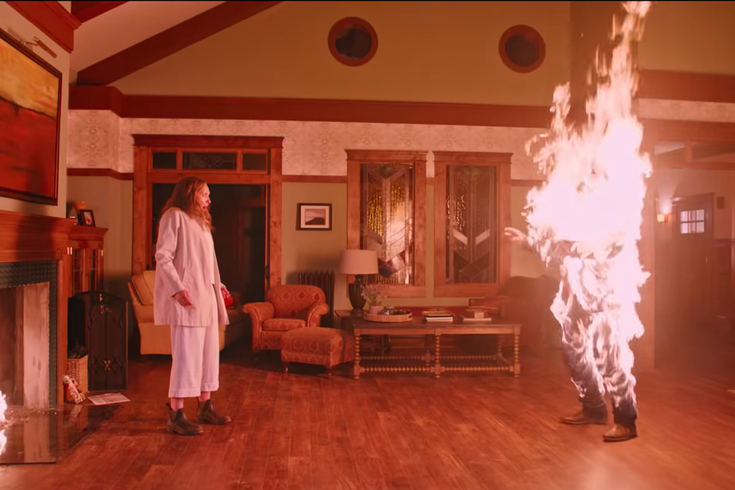 That very intense and powerful film is “Hereditary,” from first-time director Ari Aster. It opens tomorrow, and has earned some of the best reviews of any film this year. PhillyVoice spoke with Collette earlier this week about the new movie, as well as her experience filming “The Sixth Sense” and another beloved film, “In Her Shoes,” here in the Philadelphia area. The Australian actress, whose other notable credits include “Little Miss Sunshine,” “The Hours” and “United States of Tara,” was drawn to “Hereditary” when she first read the script. “I was blown away by it,” she said. Then she had a lunch with Aster, the director. “He was very impressive. I think I just connected with this film, where there was no way I could not do it. I was impressed that it was a horror film, and also a classic drama, that was so honest when it came to dealing with grief," she said. In the film, Collette stars as Annie Graham, an artist who lives with her husband (Gabriel Byrne) and two children (Alex Wolff and Milly Shapiro.) It’s best, with this particular film, to not know many plot details going in, but the setup is that Annie’s mother dies, and it leads to all sorts of strange and scary events – and if you try to guess what’s really going on, you’ll probably be wrong. Collette described her part as “emotionally extreme,” and it’s a role that truly required her to go to some dark places. She also noted that the script makes mention of Disassociate Identity Disorder (DID), having played a character with that condition on the Showtime show “The United States of Tara.” As for starring in another acclaimed horror film with a young director, all these years after “The Sixth Sense,” Collette noted the similarities. “Both [were] directors at the beginning of their careers,” she said. The actress has fond memories of her time in Philadelphia making the Shyamalan film. “I love Philly. I was very fond of the experience on the whole. Great people, great food,” she said, adding that she made great friends on the movie and that it was the first place where she got into meditation and yoga. Collette would return to the city six years later for “In Her Shoes,” in which she co-starred with Cameron Diaz and Shirley MacLaine, in a movie adapted from the novel by popular local author Jennifer Weiner. “Hereditary” opens Friday, June 8 at theaters throughout the region. Another acclaimed new film in which Collette has a supporting role, the musical comedy/drama “Hearts Beat Loud,” opens exclusively at Ritz Five on June 15.